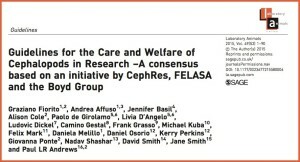 We are delighted to announce that the Guidelines for the Care and Welfare of Cephalopods has now been published as a special issue of Laboratory Animals with publication supported by the COST Action FA1301, FELASA (Federation of European Laboratory Animal Associations) and the Association for Cephalopod Research – CephRes. The publication of the Guidelines represents the culmination of several years of work that was initiated in 2011 at an international cephalopod meeting in Vico Equense (Napoli). A key theme of the meeting was sessions discussing the potential implications of Directive 2010/63/EU for cephalopod research drawing on the work of a Boyd Group working group that was also considering the implications of the changes in legislation. Although the proposal to include cephalopods in the revisions to legislation covering the use of animals in research was included in the EFSA report in 2005 the wider cephalopod research community was largely unaware of the impending changes in legislation and how they would impact research. Facilitated by CephRes a number of publications were produced that outlined the key issues confronting the cephalopod research community in meeting the requirements of Directive 2010/63/EU (e.g. Fiorito et al., 2014; Smith et al., 2013; Andrews et al., 2013). However, it also became clear that it would be necessary to produce a set of evidence based Guidelines to help the community deal with the specific requirements of the Directive and their transposition into national legislation of EU member states. The Guidelines also cover additional related aspects such as health and safety assessment of working with cephalopods and education and training. Education and training: Carers, researchers and veterinarians. 3. Reproductive strategies of some cephalopods species. These Guidelines are the first to provide advice on the Care and Welfare of Cephalopods in research to specifically address the requirements of Directive 2010/63/EU. They should be regarded as a starting point as during the writing it became clear that in several areas the evidence base was not great or was lacking and that it was not possible to achieve consensus. Finding solutions to a number of the issues raised by the Guidelines is incorporated in the aims of COST Action FA1301 CephsInAction and in particular the working groups (e.g. the development of a welfare index; identification of criteria for anaesthesia, pain, suffering, distress and lasting harm in paralarvae). Of particular relevance is the current survey to obtain views of the prospective assessment of severity of procedures in cephalopods which forms an obligatory part of applications to the National Competent Authority for research under Directive 2010/63/EU. We would like to thank all colleagues who provided their knowledge and time in preparing these Guidelines. Under COST FA1301 CephsInAction work will begin soon on collecting evidence in preparation for Guidelines 2.0 which we aim to publish in 2020. We look forward to your active participation in this project on behalf of the EU cephalopod research community.